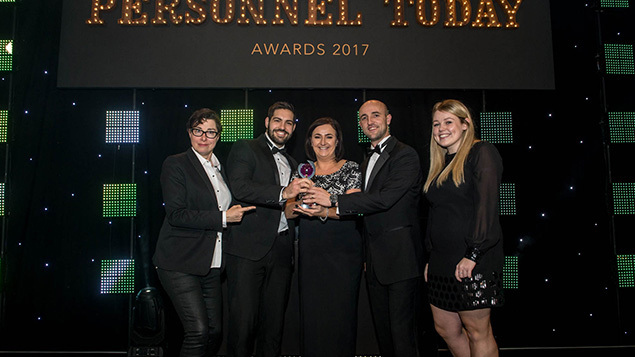 The inaugural L&D Team of the Year award attracted a high quality field and was won by TrustFord, which impressed judges with the effectiveness of its initiatives to improve retention and the induction process. With 60 dealership sites across the UK, car retailer TrustFord has an annual training budget of £1.8 million. However, in 2013 it identified it had a retention issue, with an increasing number of newcomers leaving within the first six months of employment. Exit interviews showed that the way colleagues were inducted to the business was inconsistent, sales executives were taking a long time to settle in, and there was a lack of consistent training around TrustFord’s brand values. This led to the launch of the Induction Academy in 2014 through an investment of £300,000. The academy is held fortnightly and is a full residential onboarding course lasting between two and eight days. Staff on the Sales Academy course go onto a further 90-day ‘Early Days’ training scheme to make sure they are embedded onto their role and the business. Staff turnover has dropped every year since the academy was introduced, down to 20% in April 2017 from 26% in April 2014. Six-month retention rates have increased over the same period, and in January 2017 this stood at 91%. An app helps to keep new employees connected to the business and managers feel less pressure to induct new team members. Maersk Transport & Logistics operates in a difficult environment – the container shipping industry has been under intense pressure from commoditisation for several years. To respond to this, it needed to grow its revenue, transform its business model through digital transformation, and develop a culture of high performance. The L&D team at Maersk Transport & Logistics developed strategies for each of these priorities. To support revenue growth, it built a series of sales development colleges, focusing both on the fundamentals of good selling and how managers could get the best out of sales teams. This has led to a 3% increase in overall revenue from these teams, which has the potential to add £1.1 billion to topline sales if rolled out to all sales managers. L&D has also supported the company to digitise its customer service process, which means that 97% of bookings now come through digital platforms and the customer service team has led other functions in the adoption of new IT systems. Performance management is another area that has been energised through L&D – moving it from a “mandatory HR exercise” that not every manager excelled at to a valuable feedback tool. This has led to a 5% to 12% increase in manager effectiveness scores. Judges praised Maersk Transport & Logistics for the clear business impact of these initiatives. In 2015, the L&D function at Centrica composed of 11 business-specific teams, as well as 216 people across the business undertaking learning activities. There were also 11 separate learning management systems and the FTE cost of the function was £15 million. The company, which owns British Gas, wanted to rationalise its L&D resource and focus training where it was needed. For example, 72% of L&D spend was focused on leadership and personal development, but only 28% on role-based and mandatory training. It now has a central, global L&D function far more aligned to business strategy, with costs reduced by £5 million. Central to this has been the adoption of a new Workday learning management system, which has helped Centrica to roll out a series of ‘Academies’ relevant to learners and their roles, including a management academy that has seen 2,570 enrolments in its first three months. Apprenticeships continue to be an important part of the company’s learning strategy – during the past 12 months Centrica has supported the launch of three new apprenticeships in Smart Engineering, Gas Engineering and Customer Service. Its Net Promoter Scores show that customer satisfaction has increased by 20 points, demonstrating that employees are having better conversations with customers. The new operating model has driven down costs and 92% of learners believe that the new structure has already supported them in their career ambitions. Founded in 1895, the charity National Trust needs to respond to the challenges of the fast-moving 21st century world. Its People Development Team sought a way to best support the organisation in reaching this goal. In 2015 it launched its 10-year People Strategy, ‘Playing our Part, introducing new values and behaviours and a new performance management process. In addition, it introduced an improved staff survey and brought in talent management and succession planning frameworks. Each People Development Manager is responsible for delivering a strand of this strategy. Some of the learning initiatives introduced include skills passports – initially for new trainees but now rolled out to existing staff; an induction programme for managers; and discipline reviews for roles such as rural surveyors to ensure people have the right skills and capabilities for the job. Curators have been paired with mentors and lead curators have been appointed to each region. The strategy is already producing results – fundraising income has increased from £64.4 million to £68.6 million between 2014 and 2016 and membership sales have increased from £150.3 million to £178 million. Spend per visitor has increased by 15% and the charity has saved around £2 million per year by “buying smarter”. Judges said it was “good to see learning being clearly linked directly to strategic priorities”. Recruitment consultancy Search has had a dedicated L&D function in its business, separate from HR, for more than 17 years. Following a review of the content of training and approach taken, the business decided to develop a new programme known as BEST: Be Exceptional Search Training. BEST consists of four elements: exceptional permanent recruitment; exceptional temp recruitment; exceptional selling and exceptional client visits. Managers can also attend some specific courses focused on building the skills and behaviours required to run successful teams. The L&D team placed great importance on post-course follow up, and each consultant has their own development plan to ensure their skills and techniques help them in their own particular specialism. Impact of training is closely monitored via regular reviews and activity ratios (for example job placement ratios). Search has been awarded the Investors in People Platinum standard, representing the top percentile of IIP organisations worldwide. When it received this accolade, only five other organisations had received this award. Our judges called the company’s personalised approach to development “well thought-through and planned”.